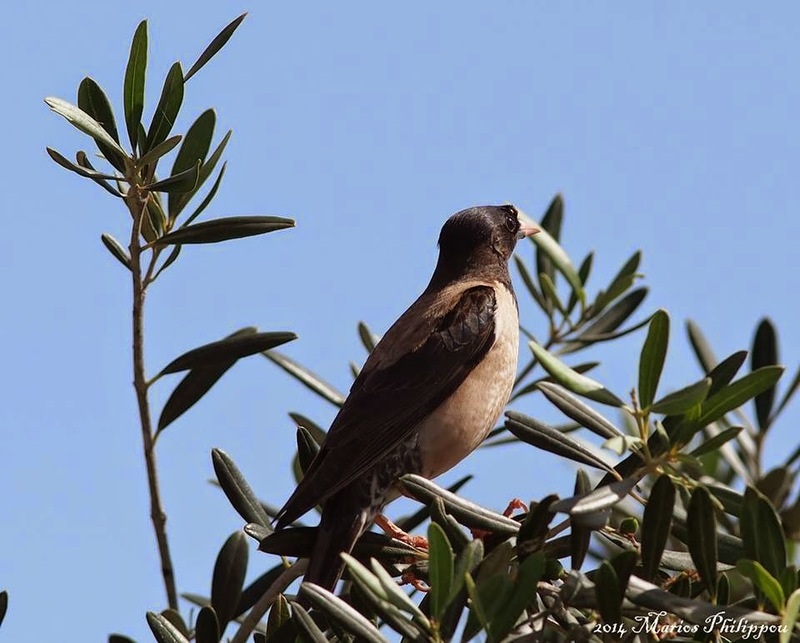 Cyprus Discovery present you Sturnus roseus (Rosy Starling, Αγιοπούλι, Ροδοχρωµοψάρονο). A rare bird in Cyprus. The rosy starling (Pastor roseus) is a passerine bird in the starling family Sturnidae, also known as the rose-coloured starling or rose-coloured pastor.The species was recently placed in its own monotypic genus, Pastor, and split from Sturnus. This split is supported by recent studies, though its closest living relatives are still not certainly known. The adult of this species is highly distinctive, with its pink body, pale orange legs and bill, and glossy black head, wings and tail. Males in the breeding season have elongated head feathers which form a wispy crest that is fluffed and more prominent when the bird gets excited; the crest is shorter in winter and the black areas have paler feather edges, which get worn away as well as the black becoming more glossy in the breeding season. Winter plumage in males is rather dull. Females have a short crest and are duller overall, especially without the sharp separation between pink and black. The juvenile can be distinguished from common starling (Sturnus vulgaris) by its obviously paler plumage and short yellow bill. Young birds molt into a subdued version of the adult plumage, lacking the crest, in autumn and acquire the adult plumage when they are nearly one year old in females, and nearly two years in males. The latter in their second year wear a plumage similar to adult females but with longer crests and noticeably pale feather edges.